Grosgrain: Don't Be a Vinyl Snob. You Might Be Pleasantly Surprised. Don't Be a Vinyl Snob. You Might Be Pleasantly Surprised. By now, some of you may have seen this in the stores and passed it over but I really want to tout the exceptional look of faux wood plank vinyl. I used it a while back to cover an existing vinyl floor in my father's kitchen and it looked amazing for the money and it still looks good over six years later. The stuff I used was only $1 per square foot and though I highly recommend it, for just a $1 more per square foot you can have so many more options to choose from. Forget your old idea of faux vinyl floors. I remember those glossy, giant sheets. And they seemed to only come in light birch. The new ones are matte, come in 4"-6" x 36" planks like real wood, have a significant texture to the surface and come in about a hundred different variations. 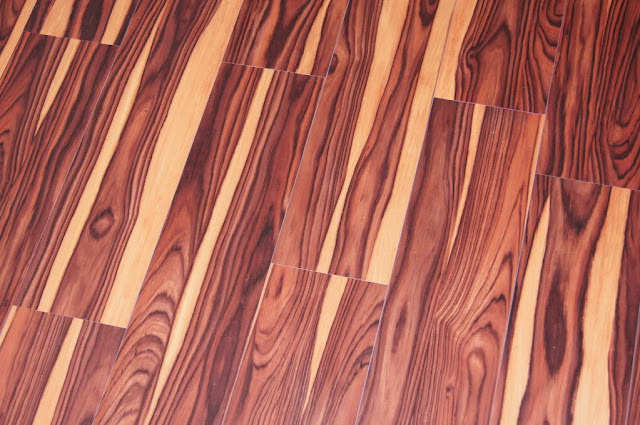 I think, personally, they look and feel better than laminate, especially the cheap laminate. But the BIGGEST selling point on this is that you don't need any special tools other than a pair of scissors. Even laminate flooring involves A LOT of extra work. With vinyl planks you don't need a subfloor, you don't need to remove the base moulding, you don't need to install a vapor barrier, and you don't need a bunch of tools to install and cut your materials. Literally peel. Stick. Done. I installed my dad's floor in less than an hour. Now, keep in mind it was a perfect rectangle and only about 90 sq. ft. of space but still pretty impressive. I recommend it to renters. If you don't mind investing a little money you can have the benefit of a gorgeous kitchen or bathroom floor instead of 1980s floral vinyl. Yuck! For only $1.79 per square foot a 10'x10' kitchen would only be $179. If you're planning on living in a rented space for a couple years and your current vinyl floor makes you want to cringe everytime you see it, I think it's worth the investment. Thanks for the info. I have a laundry room that would be a great candidate for this treatment. Unbelieveable the vinyl in the very 1st picture is Allure it is sitting in my living room as I type this acclimating to the temperature of our house. They start the installation Monday! It is wonderful very scratch resilient and water doesnt hurt it as in warping ect. I done my home work on this & originally wanted hard wood flooring throughout home but this stuff is great at a fraction of the cost of hard wood & 25yr warranty!